In the book of Revelation, we have several glimpses of various groups that follow the Antichrist. To understand all that we are seeing in the book of Revelation, we need to understand how the Elite plans to divide up the inhabitants of the earth. I believe their blueprint is something very comparable to Plato’s Republic. The Elite: The Elite will enhance their minds and bodies to include achieving immortality. They will become like demigods (or posthumans). The workers: The Elite will provide some of these benefits to regular members of society to overcome the cost of illness and, therefore, overcome periodic reduction in production of what they need. There will be sufficient modification to the DNA of the workers to remove the image of God within (i.e., mark of the Beast), thereby removing all concepts of right and wrong. The standard worker will not be able to afford the gift of immorality, but will have to settle for an extended life span, which will be extremely disease resistant. Some form of mind control or hive mind will most likely be included in the enhancements. The military force: The Elite’s enforcers will be given more powerful bodies with greater life spans than the worker class and will have a perfected version of unbreakable mind control/hive mind installed. These military forces will be nearly impossible to kill, but will meet their end at the Valley of Armageddon. Turning Humans Into Demigods—Who Will Benefit From Human Enhancement? In fact the new SkyWatchTV will begin broadcasting soon after this article goes online and several of the first shows will be with me and Dr. Horn thoroughly discussing how quickly the so-called Hybrid Age is coming. When these developments are viewed through the lens of the book of Revelation, it all makes sense. All three classes of the coming Plato’s Republic could have received the mark of the Beast and have had their DNA changed. With elements of mind control installed within both the worker class and the military class, the world becomes “of one mind,” just like in the story of the Tower of Babel. The Elite will finally unify the entire planet toward completing the unfinished work of Nimrod. But of course we also see in Revelation that one class of these new citizen-types are tormented in Revelation 9 by a transgenic horde. Death seems to flee from them, and they cannot die. They may also be the same segment of society that is thrown alive into the Lake of Fire (Revelation 19:20). Furthermore, not all who receive the Mark of the Beast are immortal. Later, in Revelation 9, four angels are loosed (most likely Watchers) who either bring their own two-hundred-million-member army with them, or they take command of the transgenic army that was released earlier in the chapter. This army slays one-third of the population on the planet. It is clear from this Scripture that the one who ascended out of the pit is the Antichrist/Nimrod, and in my new book and on the upcoming SkyWatchTV shows I postulate how after receiving a deadly head-wound there is reason to believe genetic breakthroughs are used to “heal” him and he too becomes transgenic as did the original Nimrod (who the Bible says “began to be a Gibborim” (Gen 10:8). This is the first mention of the book of God in which the names of the righteous are written. It is referred to in Scripture under various terms: “Thy book” and “My book” (Ex. 32:32–33); “the book of the living” (Ps. 69:28); “the book” (Dan. 12:1); “the book of life” (Php. 4:3; Rev. 3:5; 13:8; 17:8; 20:11–15; 22:18–19); and “the Lamb’s book of life” (Rev. 21:27). Just because “book of life” does not appear in all of these passages does not mean the reference in any one instance is to something else. Just as we have several names for the Bible—“the holy scriptures” (Rom. 1:2; 2Tim. 3:15); “the oracles of God” (Rom. 3:2; Heb. 5:12; 1 Pet. 4:11); “the law and the prophets” (Lk. 24:25–44); “the word of God” (Mk. 7:13; Rom. 10:17; Heb. 4:12); “the sword of the Spirit” (Eph. 6:17); and others—so we have several names for the book of life. Yet today there are those who seem intent on erasing this connection between mother and child, severing a part of what it is to be human. Worse, one can only speculate on how the lack of a real mother and instead being raised in a vat somewhere alongside similar siblings with no human contact before birth would affect a baby. Would it be unfair to suggest such a person might lack some of the innate nurturing and desire for human contact that we take for granted? Might this even create an individual who suffers from some sort of disconnect between himself and other human beings? Since that 2008 Encyclopedia entry was made, things have changed a lot. 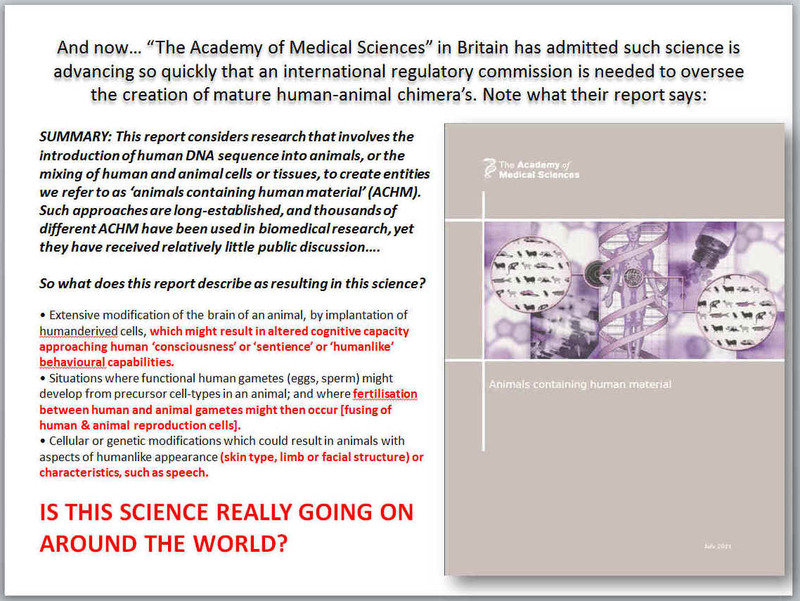 It is no longer a matter of “if” human/nonhuman chimeras can be created, as thousands of them are being concocted in laboratories all over the world. That said, could the members of Nimrod’s final army already be waiting in the wings? I have pondered over what the Battle of Armageddon will look like many times throughout my years of study as an educator and minister. To be honest, the more I observe science pushing the boundaries, the more incredible my picture becomes regarding it. I do not think either Steven Spielberg or George Lucas has the imagination to accurately portray this event. I don’t think the sci-fi mind is big enough to wrap itself around it. In the lead is Nimrod returned from the dead, and he is surrounded by his generals—man-made, immortal demigods wielding untold power. His army is first made up of genetically modified, mind-controlled super soldiers that move with unprecedented precision by a perfected hive mind. They are supported by the return of the Nephilim spirits in genetically altered bodies that resemble what they had before the Flood—powerful and terrifying. We might even be able to include the released Watchers, every fallen angel, and their minions. This scenario might include these angels standing as giants with flaming swords, or backed up by what the world believes to be UFOs providing air support. In fact, this time, Nimrod’s army will be far superior to the one he had at the first Tower of Babel. Their desire is not only to wipe Israel off the planet, but I believe they intend to accomplish what they set out to do the first time–open a dimensional portal into the Third Heaven to confront Almighty God. Such an army has never been gathered since the beginning of time! God’s darling human race, the only class of beings to whom He ever offered a way of redemption, has now been completely corrupted and stands against Him. Every fallen angel (principalities, powers, and rulers of darkness) is there, along with the children, the Nephilim. Every technological breakthrough humanity has ever developed is at the army’s disposal in this ultimate showdown. This force believes this will be the mother of all wars and it could even affect eternity. The God who upholds all things by the word of His power does not require His army to fight for Him—neither angels nor saints. He rides into battle as Messiah ben David, the Conquering King. In the time it takes for a word to be spoken from His lips, the entire luciferian army is destroyed. The transgenic blood of that army flows four and a half feet deep over the entire two hundred miles of that valley. The truth is: In all of those thousands of years when the Elite had labored to complete the unfinished work of Nimrod, they never stopped for a moment to consider that Jesus had some unfinished business of His own. The One and Only, True Messiah has been waiting more than two thousand years for the moment He will roll up His sleeves to begin the business of restoring the kingdom. The Battle of Armageddon (with the casting of the Antichrist and the False Prophet—alive—into the Lake of Fire) is equivalent to Him taking out the trash. Then, He will establish the unending kingdom as prophesied by Daniel so many millennia ago. Finally, the earth will know peace—for one thousand years. Between now and that glorious moment when Jesus returns on horseback, the remnant needs to be salt on earth, an evangelical light in a dark place, prepared for what is coming and powerful instruments in the hands of the Almighty. Tom Horn asked me a few days ago if I believe there could be one final Great Awakening. I spend the last 100 pages of The Shinar Directive outlining just how indeed I believe the Church could become the mightiest force in just the days ahead. [ii] “The Apocrypha,” The Researchers Library, Kindle Locations 2691–2695. [iii] Stephen Quayle, Xenogenesis: Changing Men into Monsters(Bozeman, MT: End Time Thunder Publishers, 2014) 229. Tags: Book of Revelation, Nimrod, Shinar Directive, Transhumanism. Dr. Lake, I’m so amazed with the insight of your teaching. I can’t wait to receive your book (The Shinar Directive) and start reading it. God bless your ministry. FYI- the link to your blog from the Seminary homepage under ‘resources’ should upon to a new window, rather than ending your Seminary homepage view. I found that scrolling in WP makes using the back arrow too awkward, as the page entries continue to load, ad infinitum. Also I was on another page that unfortunately I can’t access, where a free e-magazine is linked for PDF download, and when I clicked it- an error page appeared. Looking forward to your Shinar Directive Library package in the mail any day now! Thank you, Sir. I am privileged to know you via Dr. Horn’s ‘SkyWatch TV’ broadcasts. So glad to hear that you are enjoying the podcasts. We have some new and exciting things planned. Also, thanks for the heads up on the BLCS website. We are using a new program and a new windows was supposed to be the default. We are fixing that and uploading the corrections today. The eMag is something that really never took off. We were having problems getting the authors to submit timely articles. The good news is that Dr. Tom Horn at SkyWatch TV will soon be launching a new eMag and I was honored to be a part of this new and timely endeavor. I also saw where you requested a prospectus from BLCS. It has been dispatched today. Looking forward to having you as a new member of the BLCS student family.